Sudanese President Omer al-Bashir greets CAR elected President Faustin Archange Touadéra in Khartoum on 27 March 2016 (Photo SUNA). Link to image. December 12, 2017 (KHARTOUM) – The Sudanese President Omer al-Bashir and President of the Central African Republic (CAF) Faustin-Archange Touadéra have discussed bilateral relations and issues of common concern. Touadéra, heading a high-level delegation, on Monday has arrived in Khartoum on an official one-day visit upon an invitation from al-Bashir. 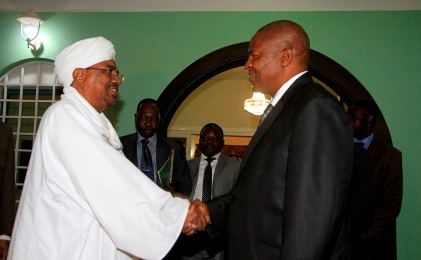 He met al-Bashir on Monday evening at the Presidential Palace in Khartoum. According to Sudan’s State Foreign Minister attal al-Mannan Bakhit, the visiting president has briefed al-Bashir on the situation in his country particularly regarding to the security conditions. Touadéra pointed out that his country is move toward reconciliation among the various groups, saying they would benefit from Sudan’s experience in the National Dialogue. The CAR president demanded from al-Bashir to broaden the economic cooperation between the two countries particularly the border trade. He also asked for Sudan’s assistance in training the CAR armed forces to enable it to carry out its tasks effectively. For his part, al-Bashir stressed Sudan’s keenness to support peace and stability in the CAR and promote economic cooperation during the coming period. He also expressed readiness to convey the National Dialogue experience to the CAR to achieve peace. The CAR suffered the worst crisis in its history since late 2012 when mainly Muslim Seleka rebels toppled the government of François Bozizé. Christian militias so-called anti-Balaka groups responded by attacking the Muslim minority. Muslims have been forced to flee the capital city and most of the west of the country, in what rights groups described as ethnic cleansing. Both sides have been accused of war crimes such as torture and unlawful killing. Elected in March 2016, Touadéra has pledged to end violence and restore security and stability in the troubled country. Steven’s mother Angeline gives an interview as his father Jotham Wekesa, and brother Bernard and other relatives listen. They are asking government to assist them find him. PHOTO | JARED NYATAYA | NATION MEDIA GROUP. Link to image. A family in Kakamega County is in agony after their son was detained in unclear circumstances in Juba, South Sudan, a month ago. Steven Wekesa was expected to fly back home on November 13, but his family says they have not heard from him after he was reportedly arrested. When the Nation team toured the family’s home in Likuyani on Monday, his parents and siblings were pondering their next move as they have not heard from their kin for the past one month. “My brother has been working for the last 11 years in Juba for various companies and we have never heard of anything unusual,” said Steven’s younger brother Bernard Wekesa. “Up to now, we are still pleading with the government to help us know what is keeping my brother in Juba.” According to the family, the last they spoke with him was on November 12 when he assured them that he would be coming home for holidays. “But at 11am when he was supposed to be in Nairobi, his phone remained switched off,” said his brother. This prompted his family to call his friends back in Juba who confirmed that he had left for the airport. The family claims that Steven’s colleagues told them that he was arrested by people claiming to be from “national security” and taken to a place called Blue House, a detention centre. “We contacted his employer but he said he had no idea what had happened, but promised to look into the matter. He is yet to get back to us,” said Steven’s father Jotham Wekesa. The family claims that Steven’s friend in Juba said he saw him in the cells. “The friend told us that he was allowed to see him and he called us to confirm that Steven was indeed alive but that there is an investigation going on,” said the distraught father. “He thereafter said that they were waiting for the director general to sign his release after investigations were completed but since then we’ve heard nothing,” he added. The family has also contacted the Kenyan Embassy in Juba but no help has come. “My son has been the sole provider to this family since I can remember. He has helped in making sure that his siblings have gone to school and that we have food on the table. He has also seen taking care of our medical bills as we are aged,” the father said. Steven’s wife Vivian Ingaso said she is having a difficult time explaining the whereabouts of her husband to the children since they were expecting him. “We were looking forward to meeting him at the airport when he comes home and it is saddening that he has not come,” she said. “I am appealing to the government to ensure my husband arrives home safe.” The couple has seven children. The family says that since he started working in Juba 11 years ago, their son has never been on the wrong side of the law. “We are very worried. We fear he is being mistreated where he is. 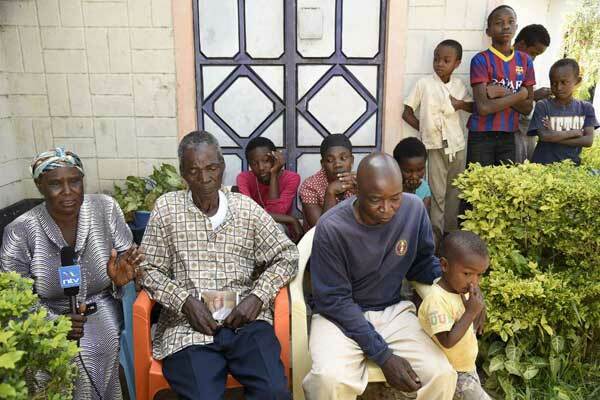 His children need him,” said his mother Angeline Wekesa. “He has worked since he was young in Nairobi and I have never heard of him being irresponsible. He has assisted us and he takes great care of his children,” added the mother. New York – The prosecutor of the International Criminal Court on Tuesday accused some of its members, including Jordan, Uganda and Chad, of undermining the tribunal’s “reputation and credibility” by refusing to arrest Sudan’s president to face charges of genocide in his country’s Darfur region. Fatou Bensouda also criticised the UN Security Council, saying it has failed to take action against Sudanese President Omar al-Bashir and others accused of crimes against humanity and war crimes in Darfur during fighting since 2003 or to act against nations that fail to carry out arrests. She said the court’s judges have ruled that the failure of ICC members to apprehend al-Bashir and others sought by the tribunal clearly violates the Rome Statute that established the ICC. Bensouda said Monday’s court decision that Jordan failed to comply with its obligation as an ICC member to arrest al-Bashir in late March underscored the requirement of the 123 countries that are parties to the Rome Statute to arrest and hand over all those sought by the tribunal. It found that al-Bashir’s immunity as a head of state under customary international law does not bar ICC parties from executing an arrest warrant and decided to refer Jordan’s noncompliance to the Security Council and the assembly of the 123 ICC parties, which is currently meeting at UN headquarters in New York. Bensouda criticized the Security Council for refusing to take action on previous referrals and requests, saying this “only serves to embolden others” to invite al-Bashir to their countries. They are “safe in the knowledge that there will be no consequences from this council for such breaches”, she said. In addition to citing the Sudanese president’s visit to Jordan, she noted his recent stops in Uganda and Chad. Uganda hosted al-Bashir in mid-November, even after being referred to the council in July 2016 for its failure to arrest him during a May 2016 visit, Bensouda said. Chad hosted al-Bashir during the first week of December, also after being referred to the council over previous visits in December 2011 and March 2013, she said. Bensouda noted that al-Bashir also visited Russia, which is not a party to the ICC, on November 20. All these visits “underscore the detrimental impact on the court’s reputation and credibility in the eyes of victims who have pinned so much hope on the court to deliver justice for their suffering,” the prosecutor said. She called on the council “to prioritise action” on the outstanding arrest warrants and stressed that the ICC will continue efforts to bring those accused of war crimes to justice. “I hope there will be solace in knowing that as history of international criminal justice has often demonstrated in practice, time is not on the side of perpetrators, but the victims and the cause of justice,” Bensouda said. 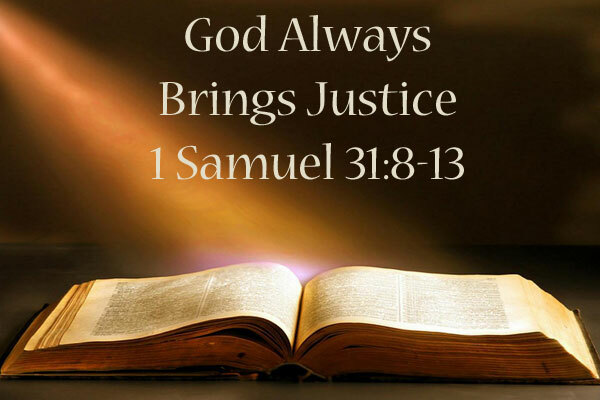 The God who takes hold of their hands……. “‘Do not fear [anything], for I am with you; Do not be afraid, for I am your God. 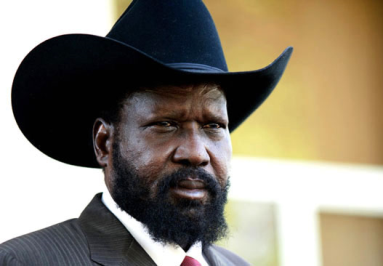 South Sudan gained independence in 2011, but descended into civil war four years ago when President Salva Kiir (pictured) accused his deputy Riek Machar of trying to oust him. Picture: Xinhua/Mohamed Khidir. Link to image. Ganyiel – Surrounded by swamps and accessible only by plane or boat, South Sudan’s Ganyiel, a rebel-held town in a country torn apart by civil war, has been dubbed a “haven of peace” by its residents. Impoverished and living with the constant threat of floods, Ganyiel’s population of some 40 000 people nevertheless consider themselves lucky. Several ethnic groups live together relatively peacefully – navigating the town’s waterways in tree-carved boats. The world’s youngest nation, South Sudan gained independence in 2011, but descended into civil war four years ago when President Salva Kiir accused his deputy Riek Machar of trying to oust him. The war has killed tens of thousands of people and created Africa’s largest refugee crisis. December 11, 2017 (JUBA)- South Sudan president on Monday issued an order declaring the state of emergency in the three states of Gok, Western and Eastern Lakes. 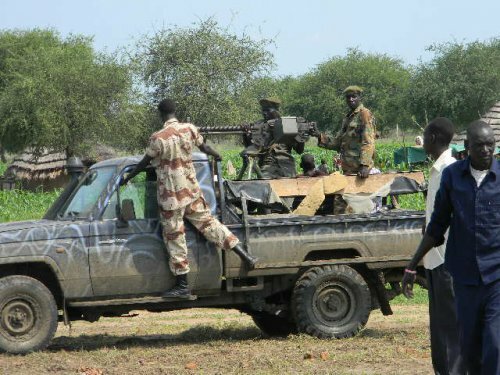 The order announced by the state-owned South Sudan on Monday evening ordered the government forces to move into the region and carry out forceful disarmament with immediate effect. The president issued the order after legislators from Gok, Western and Eastern Lakes petitioned him to declare a state of emergency in the region and order for forceful disarmament. the implementation of these measures would help protect lives and properties of the civilians. The representatives o the area were prompted by clashes in which scores were killed in a series of clashes among youth in Chueichok, Mayom and Apet areas. Several houses were also burnt to ashes in the violence that erupted last week over a land dispute in Malek County. The authorities have however reported that the situation in the area which has witnessed surge insecurity has improved following the recent deployment of security forces. South Sudanese president Salva Kiir (AFP). Link to image. December 11, 2017 (JUBA) – South Sudan president Salva Kiir has rejected a proposal calling for the establishment of a technocratic government in which no political leader seeking to contest in elections, is allowed to participate. The technocrat government, the regional bloc (IGAD) said in a proposal submitted to the pre-revitalization forum, would prepare a level ground and create a conducive environment for the parties that would contest in the forthcoming elections. The people would participate in the government would be drawn from the three regions of Upper Nile, Equatoria and Bahr el Ghazal. The office holders, according to IGAD’s proposal, are envisaged to be men and women selected and vetted on their qualification and professional expertise or experience irrespective of any affiliations to a political party, civil society group or association. The new proposal has, however, not gone well with President Kiir, prompting the South Sudanese leader to question its legitimacy and who mandated it. “I have been hearing around some people have come out with proposals and their views have appeared in the pre forum and the report of the IGAD special envoy. Recently my opinion who asked on this proposal by some of the regional leaders I met when I went to Kenya to attend the inauguration of President Uhuru Kenyatta and I said I did not see the proposal and so i would not comment before I see it,” said Kiir during a meeting with his advisors on Monday. 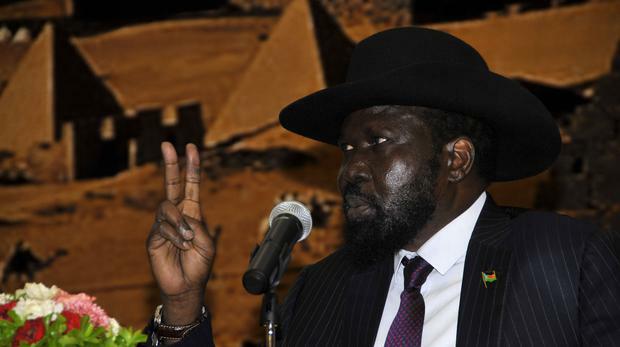 The South Sudanese leader has now ordered that the summary of the proposal from IGAD be given to him by Wednesday this week. “If you have this report and it is one of the reports I am yet to receive, please make sure it is summarized and I get the summary by Wednesday. There are people who assign themselves and what they do get out in the name of the people,” stressed the president. He added, “The people who do these need to be known”. President Kiir, sources in the coalition in the government told Sudan Tribune, is opposed to a new government without him because he believes it is part of the strategy to prevent him from contesting in the next general elections. “All these proposals are tactics to implement the regime change agenda. So whenever their plans have been frustrated, they go come out with other strategies. The objective remains the same and I don’t think people will accept. The people making this proposal should come out to tell the citizens”, further said the president. A former South Sudanese minister in the coalition government supported a technocratic transitional government in the war-torn nation, saying it will deliver the transition to its “intended” purpose. According to Lam Akol, Sudan, from which South Sudan seceded in July 2011, has seen two technocratic transitional governments in its modern history and that both came about after popular Uprisings overthrew the military juntas (in 1964 and 1985) and led the transition to democratic elections. “Of course, technocratic transitional governments are not without problems, but taking all factors into account they come up far on top compared with a transitional government of politicians if the purpose is to prepare a level field for all”, Akol wrote in an opinion Sudan Tribune published in September. “That purpose is to prepare a level ground for all citizens for the country to leave its troubled past behind and embark on a truly democratic path,” he added. The Hague – War crimes judges on Monday delivered a slap to Jordan, referring the Arab country to the United Nations for action for failing to arrest the visiting Sudanese president wanted on genocide charges. Despite two international warrants for his arrest on 10 charges arising from the conflict in Darfur, Sudanese President Omar al-Bashir freely attended an Arab League summit in Amman in March. Judges at the International Criminal Court (ICC) ruled that “Jordan failed to comply with its obligations … by not executing the court’s request for the arrest of Omar al-Bashir and his surrender to the court while he was on Jordanian territory on 29 March 2017”. Jordan is a member of the Rome Statute, which underpins the tribunal – established in 2002 to try the world’s worst atrocities – and as such has agreed to comply with the court’s orders. The ICC issued arrest warrants for Bashir in 2009 and 2010, but he has so far evaded arrest and steadfastly denies the charges related to the conflict in war-torn Darfur. The judges decided that Jordan’s “non-compliance” should be referred to the UN Security Council as well as the tribunal’s own Assembly of State Parties. But it is unlikely there will be much further action taken at the UN. In July the judges already ruled that South Africa had flouted its duties to the ICC in 2015 by failing to arrest Bashir, when he attended an African Union summit. But presiding ICC judge Cuno Tarfusser, who also signed Monday’s order against Jordan, decided that it would be “effectively futile” to refer Pretoria to the UN. There have been six previous referrals of various countries to the Security Council for allowing Bashir to travel freely on their territory. Pretoria’s lawyers had argued at an April ICC hearing there “was no duty under international law on South Africa to arrest” Bashir. But the judges ruled international obligations cannot “simply be put aside” if a country disagrees with them, and said Bashir did not enjoy immunity. Decembers 8, 2017 (KHARTOUM) — Hundreds of protesters in the Sudanese capital rallied on Friday to condemn the decision of U.S. President Donald Trump to recognize Jerusalem as Israel’s capital, as the U.S. embassy warned its citizens of the protests. Following Friday prayers, the protesters gathered outsides Khartoum mosques with placards condemning Trump’s decision and others hostile to the U.S. and Israel. Khartoum’s protests were part of a campaign across the Islamic world on Friday in support of the Palestinian people. 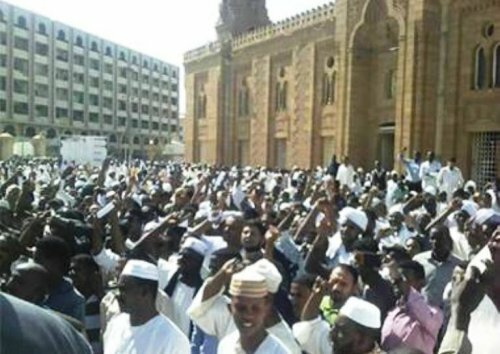 However, a Sudanese presidential aide, Ibrahim al-Sanosi addressed a demonstration in from of Khartoum Grand Mosque and expressed his rejection of the American move. Al-Sanosi who is also a leading member of the Popular Congress Party (PCP) condemned call to establish diplomatic relations with Israel by other ministers. ” As the government of Islamic Movement and National Consensus, we are against normalization with Israel and we will silence any tongues calling for normalization with Israel,” said the Sudanese Islamist who led the PCP after the death of its founding leader Hassan al-Turabi. This will not happen and we are alive in this world,” he further stressed. Last August, Mubarak al-Fadil al-Mahdi, Sudan’s Deputy Prime Minister and Investment Minister expressed support for the establishment of ties between his country and Israel and called for normalization of bilateral relations. In a related development, the U.S. embassy in Khartoum warned its nationals to exercise caution of potential protests against Trump decision to recognise Jerusalem as Israel’s capital and to move the U.S. Embassy to the disputed town. “The recent announcement that the United States recognizes Jerusalem as the capital of Israel and plans to relocate the U.S. embassy from Tel Aviv to Jerusalem may spark protests, some of which have the potential to become violent,” the U.S. embassy wrote on its website. “U.S. embassy in Khartoum reminds U.S. citizens of the need for caution and awareness of personal security,” it emphasized. The warning further advised the U.S. nationals to “avoid areas of demonstrations, and exercise caution if in the vicinity of any large gatherings, protests, or demonstrations”. Sudan’s government has rejected Trump’s decision, while the parliament called to recognise Jerusalem as the capital of Palestine. December 9, 2017 (JUBA) – South Sudan government on Saturday lauded the decision of the President of the United States Donald Trump in which he recognized Jerusalem as the capital of Israel. Trump on Wednesday formally recognized Jerusalem as Israel’s capital and instructed to begin the procedure of moving the U.S. embassy to Jerusalem. His decision was immediately condemned by the international community as Palestinians said Washington can no longer mediate between Israel and Palestinians. However, a top presidential aide in Juba told Sudan Tribune on Saturday that the government through its embassies had sent congratulatory messages to both U.S. President and the Israel Prime Minister. “Only hard times reveal true friends and because of this, the government of the Republic of South Sudan, on behalf of the people sent to both U.S. President Donald Trump and the Israel Prime Minister Benjamin Netanyahu, congratulatory messages on the recognition of Jerusalem as the capital of Israel,” a top presidential aide told Sudan Tribune on Saturday. “These messages have already been delivered and they have been received by both leaders,” he further said. 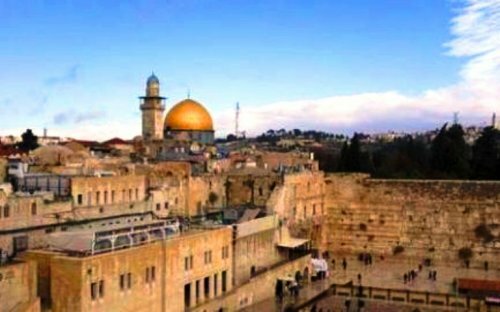 The status of Jerusalem, which is home to sites holy to the Jewish, Christian and Muslim faiths, is one of the thorniest barriers to a lasting Israeli-Palestinian peace. Palestinians claim East Jerusalem, which Israel captured in 1967, for the capital of an independent state they seek in peace talks. But Israel considers Jerusalem its eternal and indivisible capital. The South Sudanese presidential aide described the recognition of Jerusalem as a record-breaking decision to congratulate President Trump and his administration. The motive behind congratulatory messages remains unclear. Diplomats and Analysts interpret the move as an attempt by South Sudanese government solicit sympathy from U.S. government and her allies to relax their position and views on how the current government under the leadership of President Salva Kiir was managing the affairs of the country.